A Slice of Smith Life: 7 Quick Takes: The Story of the Bible Review and Giveaway! 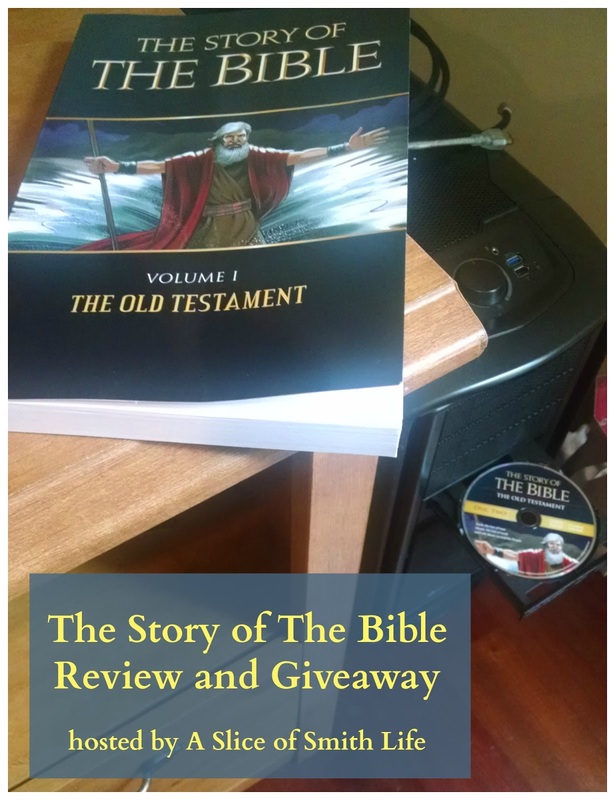 7 Quick Takes: The Story of the Bible Review and Giveaway! Our family just celebrated Michaelmas, the feast of the Archangels on September 29th and St. Therese of Lisieux on October 1st. It is a big month for several popular and fun feast days in the Catholic Church so why not add to the celebrations with a review and giveaway? UPDATE: This giveaway is CLOSED and the winners were Karen Reep, who won the Old Testament Audio Book, and Lisa Boyle won the New Testament Audio Book. Congrats ladies and thank you everyone for entering! This week's 7 Quick Takes hosted by Kelly at This Ain't the Lyceum is my review and a giveaway of The Story of the Bible published by TAN Homeschool. I first heard of The Story of the Bible at the Edel Gathering I attended in July 2015, where TAN Homeschool had a table set up with this Bible history series. I was excited to receive a copy of The Story of the Bible: Vol. 1-The Old Testament Text Book, The Story of the Bible: Vol 1-The Old Testament Test Book, and The Story of the Bible: Vol 1-The Old Testament Dramatized Audio CDs in exchange for this review. I usually read from The Old Testament Text Book to my children or we listen to the Dramatized Audio Book after lunch once a week when my toddler is taking a nap. My children prefer listening to the stories on the CD vs. listening to me read it out loud. The stories, that highlight major Old Testament events, are easy to understand for all ages, yet at the same time they don't lose their authenticity. The audio book has been a great resource at home or in the car if we are "road-schooling". The CDs keep all my children's attention, from teen down to toddler. After we finish each chapter, I give my children the test from the Test Book for the corresponding chapter. The tests contain quizzes made up of multiple choice and matching sections. As a parent who is juggling the schooling of different grade levels, I am grateful that there is an answer key at the back of the book for easy and quick grading to see how well my children comprehended each story. My children told me that they enjoy listening to the Dramatized Audio Book because the sound effects and narrator's voice keeps their attention and it helps them stay engaged during the entire chapter. I remember in the first chapter about creation, there was a baby crying on the CD and my children were laughing and wanting to replay that part over and over again, especially my 7 year old daughter. As a homeschool mom, I'm always on the look out for curriculum that I can use across many grade and age levels. The Story of the Bible can definitely be used with a wide range of ages. 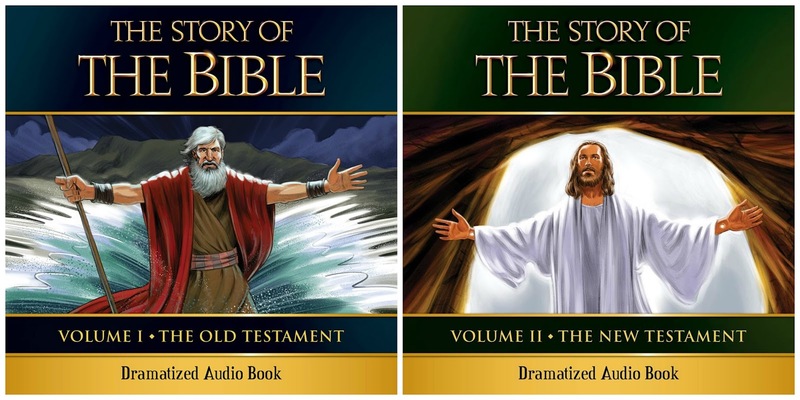 You can purchase The Old Testament Complete Set that includes the Text Book, Test Book, Teacher's Manual, Activity Book, Dramatized Audio Book, and the DVD lectures or purchase each of these separately. After you use The Story of the Bible-Old Testament then you can move into the New Testament, but you can start with whichever set you like. The New Testament Complete Set includes the Text Book, Test Book, Teacher's Manual, Activity Book, Dramatized Audio Book, and the DVD lectures and like the Old Testament resources, the New Testament set can be purchased separately, as well. I look forward to using the New Testament resources as soon as we complete the Old Testament. Now that I got you interested in TAN Homeschool's The Story of the Bible series (I hope), TAN Homeschool is giving two of my readers a chance to win an Old Testament Dramatized Audio Book or a New Testament Dramatized Audio Book! The Audio Books are CDs that can be listened to at home or on the road. This giveaway will be open from Friday, October 2 through Friday, October 9, ending at midnight on October 9. I will contact and announce the winners on this post on October 10. I will choose 2 winners, one for the Old Testament Audio Book and one for the New Testament Audio Book. I will have my children choose the 2 winners randomly from the entries in the comments on this post. Since Rafflecopter is not downloading for me to gather entries, I'll have to collect entries old school :) You will have up to 5 ways to enter giveaway. Leave a comment on this post and let me know which Audio Book you would like to win, Old Testament or New Testament. Please make sure to leave your email address in the comment if you do not have an attached profile account where your email is listed. This will be how I contact you if you are chosen as one of the winners. After you leave the mandatory comment you may do any or all of the following entries and leave a separate comment for each entry you do. Visit TAN Homeschool on Facebook and "Like" their page. Leave a separate comment on this post that you "Liked" TAN Homeschool's Facebook page. Visit my blog Facebook page, A Slice of Smith Life, and "Like" my page. Leave a separate comment on this post that you "Liked" A Slice of Smith Life's Facebook page. Pin this giveaway on one of your boards on Pinterest. Leave a separate comment that you did pin this post and leave the link where you pinned it. Subscribe to my blog via email. You can add your email address in the box that is located on my right side margin under my profile photo. Leave a separate comment that you subscribed to my blog via email. 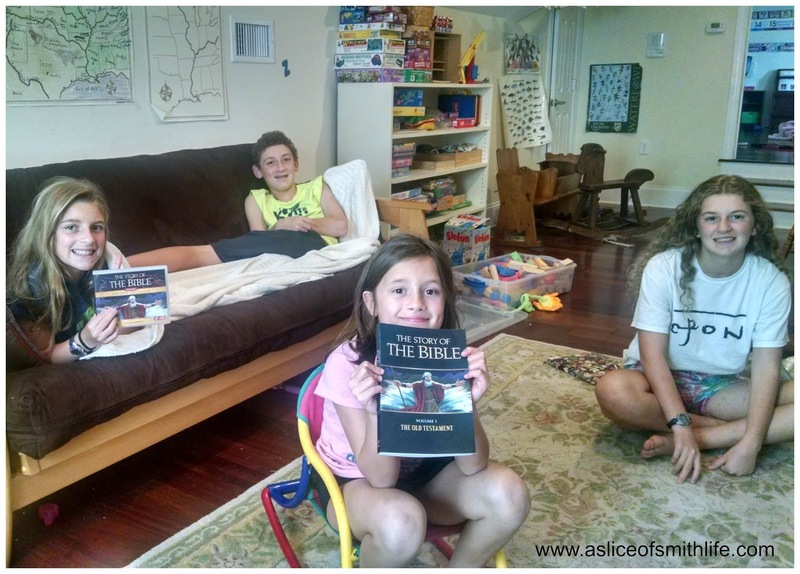 I hope you will enjoy The Story of the Bible from TAN Homeschool as much as our family has this year! I'd love to win the Old Testament version! What a lovely giveaway, thank you! I liked the TAN page! Thanks! I liked A Slice of Smith Life a long time ago! Love your blog! I subscribed! My email is reep0925@yahoo.com. Thanks! It would be wonderful to win either one, but I will choose to start with Old Testament. May I win the New Testament version? Thank you for letting us know about these resources, they look fantastic! God blessings. Either would be awesome, but I'll go with the New testament. Thanks! Would love to win the Old Testament! Thank you! That's so funny your kids were cracking up at the baby crying, must have caught their attention! I can do a pretty good impression of my children crying ;) anyways, we'd love to win the NT! Jfahy12@comcast.net would be the email to reach me at. God bless! I would love to win the New Testament, Thanks! I would love to win the New Testament. Thanks for offering such a wonderful giveaway, friend! I liked your Facebook page as well. Thanks for the giveaway! I would love either one, but New Testament if I HAVE to choose. Thanks! Sharing out now, Thank you for linking up with the FrugalMommas team! I would like to win the Old Testament. I "Liked" TAN Homeschool's Facebook page! I would like the New Testment. Thanks for sharing. Liked A Slice of Smith Life FB page.